Ships from and sold by United Global Products. Tracing its roots back to the early 20th century in England, Milton Brook has been producing some of the best loved mortar & pestles in the world. 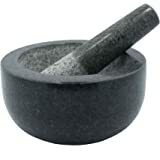 Tagged as an iconic kitchenware, Unglazed Mortar and Pestle delivers a strong practical purpose. 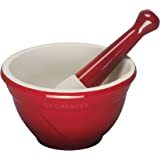 Designed for comfort and ease of use, the mortar and pestle with their characteristic unglazed finish and beechwood handles, are excellent for crushing and grinding of herbs and spices in the traditional manner. 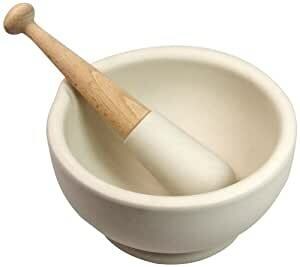 The mortar and pestle are of high quality and does not stain, absorb or transfer odors or tastes to the next task. 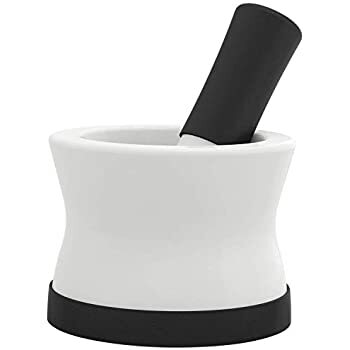 Made from vitrified electrical porcelain, the mortar and pestles have a strong structure and density making them dishwasher, freezer and oven proof. The set is also available in six different sizes, each holding different capacities to meet various consumer needs. Milton Brook by Wade Ceramics brand has been synonymous with indispensable pieces of kitchenware and has focused on crafting products of highest quality, using the finest British raw materials and skilled workmanship. 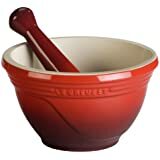 The company continues a rich tradition of over 200 years of traditional English cooking and showcases its expertise in each iconic mortar and pestle. Truly a market leader in design and production of high-quality ceramic products. 5.0 out of 5 starsAwesome, just plain awesome! 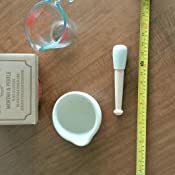 This is the best little mortar and pestle to get. The 6 inch size is about the perfect size. By 6 inches, they aren't referring to the inside diameter of the bowl. Instead, they are referring to the outside diameter of the bowl. 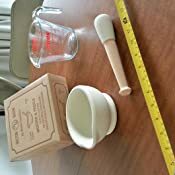 On the box it comes in from the manufacturer, it should state Size 3, which is the manufacturer's size number that refers to the 6 inch size mortar and pestle. I think they have about 6 standard sizes. I ordered 3 of the sizes the 4 inch, 6 inch and 8 inch. 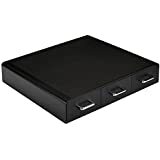 The 4 - 4.5 inch is Size 1, the 6 inch is Size 3, and the 8 inch is Size 6. 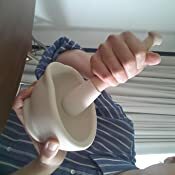 The best thing about this mortar and pestle is the handle. I've used other brands and those typically all have shorter handles which force you to grip the handle awkwardly. This brand gives you a longer handle that is much easier to grip. What is nice about that is you avoid the hand cramps that you get with the other brands. 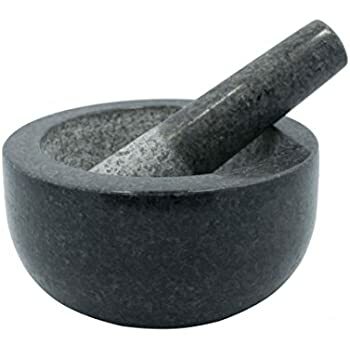 The surface of the mortar and pestle also does a great job of grinding. The only thing an owner of this brand might not like is that I think it is likely to discolor easily. 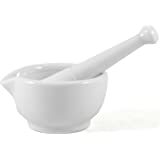 But with a mortar and pestle, I think you are either going to get good grinding or it is going to discolor easy. You can't have the best of both worlds. 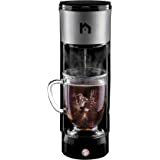 The granite type, marble type and glazed ceramic type won't grind as well as these do. And with those you'll get hand cramps from the short pestle. This brand has been around since 1810. And I'm guessing they've been used for that long by probably the likes of doctors, chemists and pharmacists and cooks to do the great job that they do. They are well designed. My favorite for all around grinding is the 6 inch. The 8 inch one seems huge, but I've come to like it a lot too. It seems easier to make guacamole in the 8 inch one that in a molcajete unless you get a really big molcajete. A regular sized molcajete seems better suited for grain hand grinding. 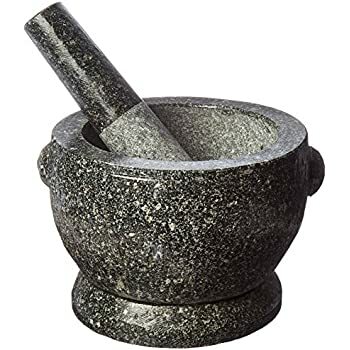 For a mortar and pestle, I'd have to rank this brand as the very best that I've seen. 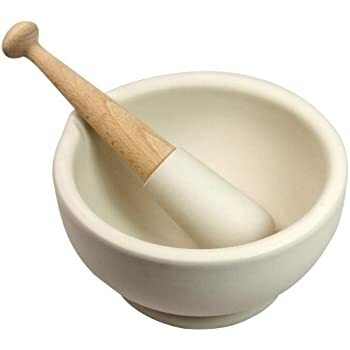 Beautiful Milton Brook Range Unglazed Mortar & Pestle are very lovely, heavy, practical items for the kitchen. This beats using a food processor for just small things; a few peppercorns, mashing garlic, or ginger, or bruising herbs for a vinaigrette. This sits proudly on my counter, next to the stove; and I use it daily. 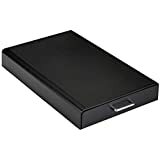 It washes up like a breeze, and does not retain any odors of the foods I have processed in it. That was an initial concern, but so far, I have had no issues in cleaning this out and washing up. I would imagine that if one were to process something and perhaps let it sit, such as garlic, one could rinse it out, then put baking soda in, let it sit, then do a thorough wash-up. That s only theoretical, of course, in a hypothetical situation. I say buy with confidence! It is a lovely and practical piece that has earned a place in my kitchen! This is a joy to use and so beautiful. I was worried about it being too heavy but I think it's perfect. I can easily use it set flat on a work surface or held in my hand and cradled against my body. The wooden handle is soft and has been sanded to perfection. I've been careful not to get the handle soaking wet when I clean it, but if you are concerned about that it would be simple to give the wood portion a light coating of beeswax to help it resist fluids. The bowl is also quite sturdy. I dropped it full on the floor once and was terrified that it would crack. It survived just fine. I know this is expensive for a mortar, but in this case you really do get quality for price. 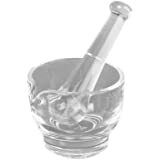 This mortar and pestle set is heavenly. It would make an AWESOME gift for someone, but consider getting it for your own kitchen adventures as well. When you see it, you'll wish you had it for your own culinary mayhem. I haven't been this excited by a purchase in a long time. 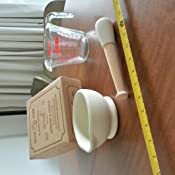 This MB mortar & pestle set has actually far exceeded my expectations, and I'm disturbingly particular about kitchen things. It's pleasing in the hands weight-wise and texture-wise, and it isn't too heavy or awkward to use size-wise -- even for my fairly small hands. I think it's one of the most sensually wowza! items I've ever bought myself, so how cool that it also has a strong practical purpose. Form and function, five stars all the way around. This M&P set is entirely unglazed, inside and out. It feels really luxe, has a definite magic about it. Wondering if it's the silica in the porcelain that makes it sort of glitter in the light? Not only is the unglazed porcelain of the perfect gritty texture for grinding, but the 6-inch diameter is exactly the right size for my purposes (spice/seed grinding, masala mixing, garlic mashing, macerating herbs and peppers, pesto making for two (though if you want it primarily for making pesto in one bowl full, you might want the next size up, especially if you're cooking for more than two). I had no real sense of which size to buy, but this was a good guess. 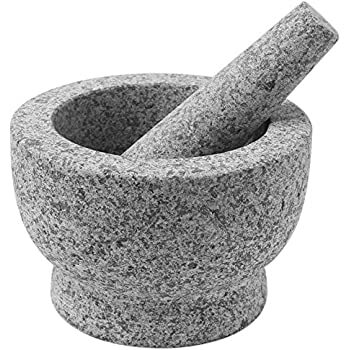 It's worth mentioning that I'm ultimately quite pleased I chose this instead of a Thai granite mortar & pestle, which I'd been seriously considering. The heaviness of a Thai granite set may make the grinding go faster, necessitating less energy expenditure, etc. (plus the natural granite is beautiful in its own right) -- but I think the simple aesthetics of this one will evoke a big grin from whoever uses it, plus it's perhaps more practical when all is said and done... Three factors made me choose this one over a granite one: One, I wanted to see the colors of the ingredients I'm working with, and this light-colored bowl allows for that. It's actually slightly lighter in color than shown in the photo, a creamy off-white. Two, I wanted to be able to hold the bowl in my hands sometimes while I grind and move around the kitchen with it; a granite M&P of this size would be too heavy for me to do so easily. Three, this M&P was more affordable ($25 on Prime) than the granite options, but the quality is very evident. OK, enough said. I'm happy. Hope this set will last me for years and years. If you get one, hope you love it, too! This is a good size for spices . You can mix like crazy and no flying pieces. Cleans easily also. I can not imagine a more perfect product. It is a joy to behold and a pleasure to use. I coated the wooden pestle handle with bees wax mixed with a little boiled linseed oil but only because my hands are seldom clean. I make herbal preparations and some are wet some are dry. 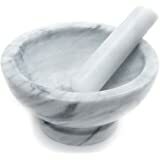 I can unequivocally recommend the Milton Brook Range unglazed mortar & pestle.